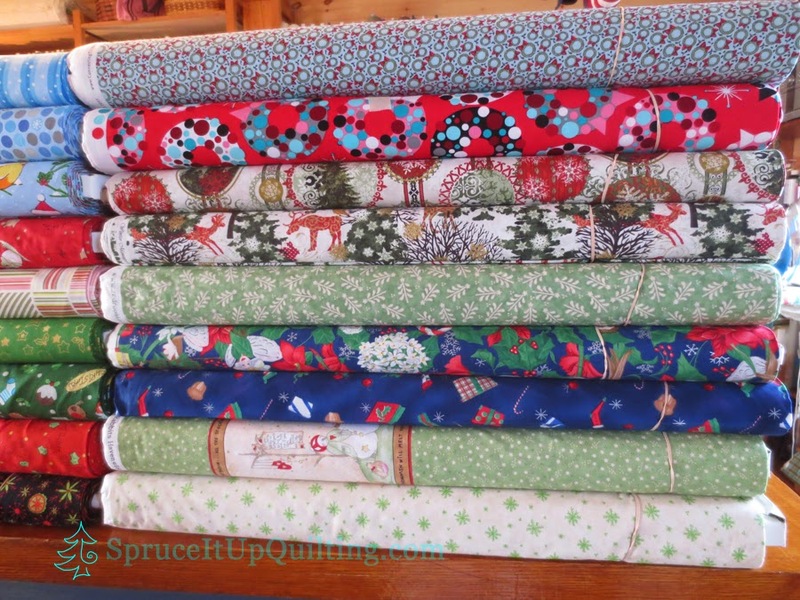 Spruce It Up Quilt Shop has just received a shipment; 32 bolts mostly of Christmas fabrics!! Come in and join the fun!! You know the holidays are just around the corner and it's time to prepare! You know we're running out of room... and there's more coming... YIKES!! PS: Did you spot the bicycle fabric??? Dear to my heart!!! 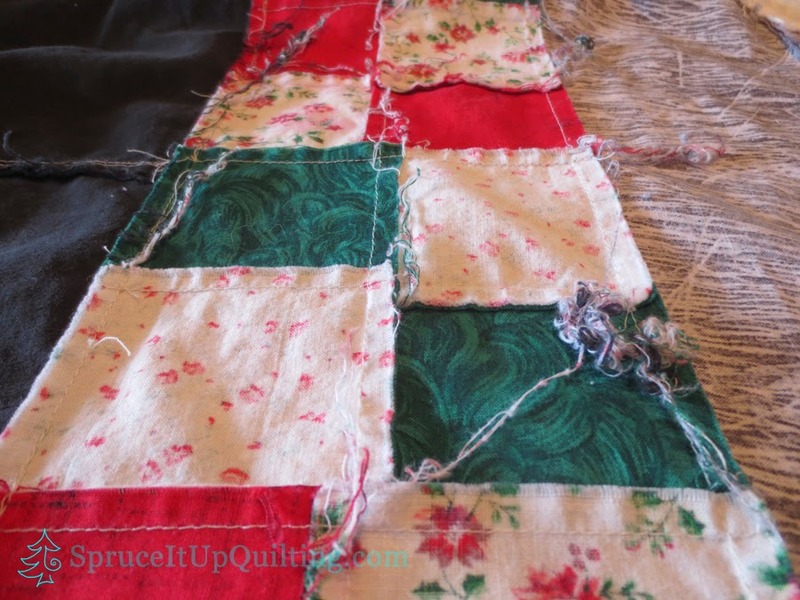 Anatomy of a Tied Quilt! 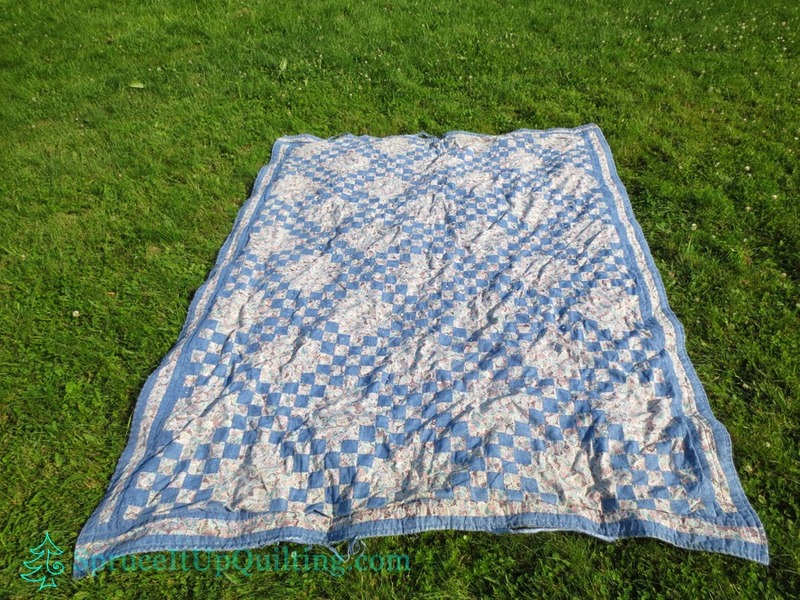 Do you tie quilts to give as gifts? I have done so a few times and I hope the quilts have survived. I have even tied a quilt I kept for us to use as an every day quilt on our bed. However, that quilt has a cotton batting, the ties are close together and I am careful when I wash/dry it. This is Allison's quilt... our mother made this with my sister Jocelyn's help (Allison's mother). You can tell it's been well-loved. The fabrics have faded over the last 14 yrs. 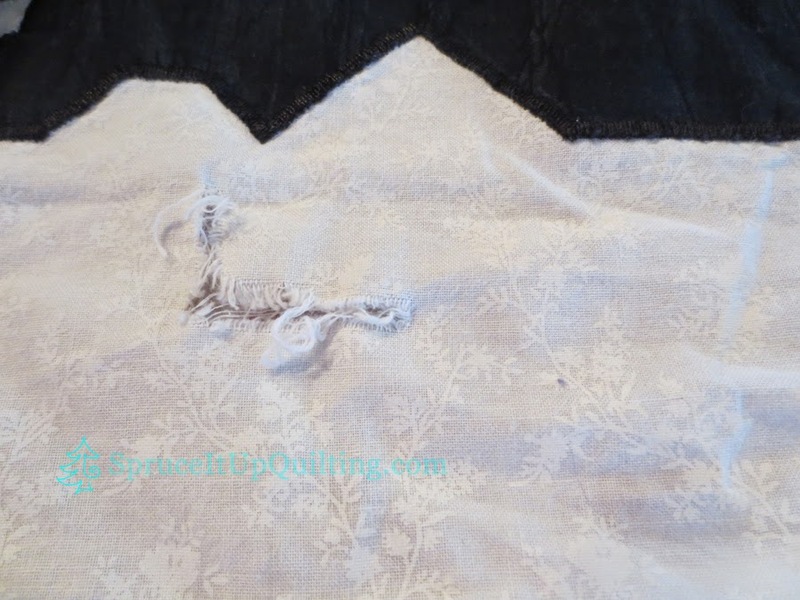 The binding has frayed and is coming apart. In places it has completely given way! 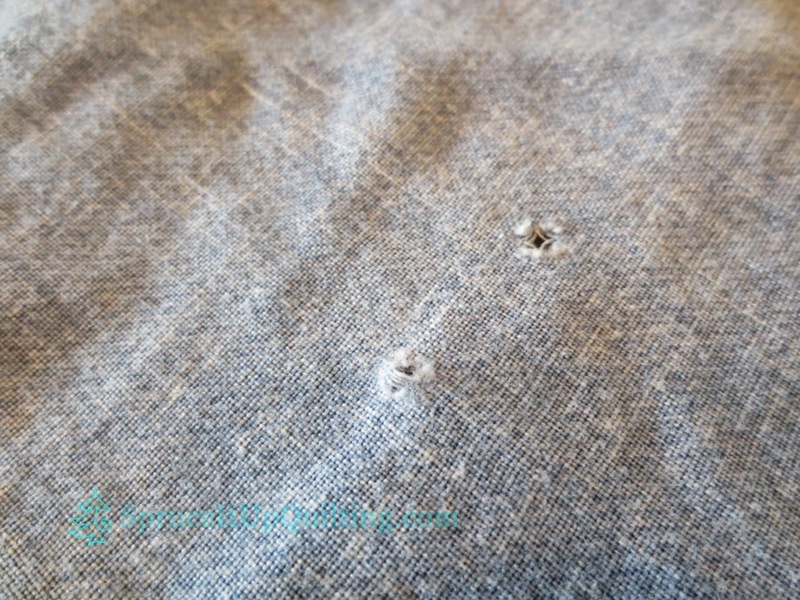 The backing is riddled with holes from the ties. The ties are still white! I'm now in the process of cutting all the loose threads and knots on the back of the top. The backing is too frail to use and won't be saved for the binding. 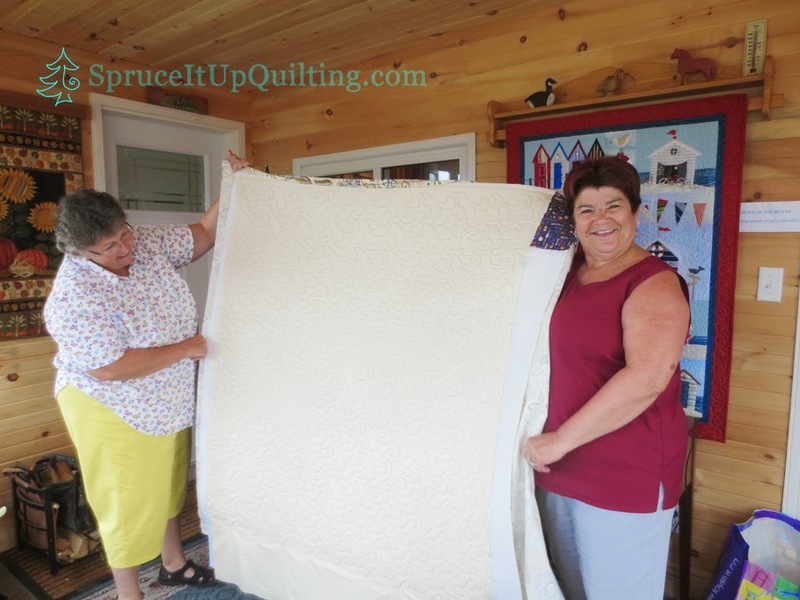 Next time you want to tie a quilt, consider using a cotton batting... I bet it would withstand a little more love! Remember Jason's quilt? I worked on it last week and finished it on Sunday morning. Here it is minus the binding. I think I'll use the same backing fabric for the binding... as I was working on Allison's quilt, it came to me that the backing of this duvet cover would be too frail also. 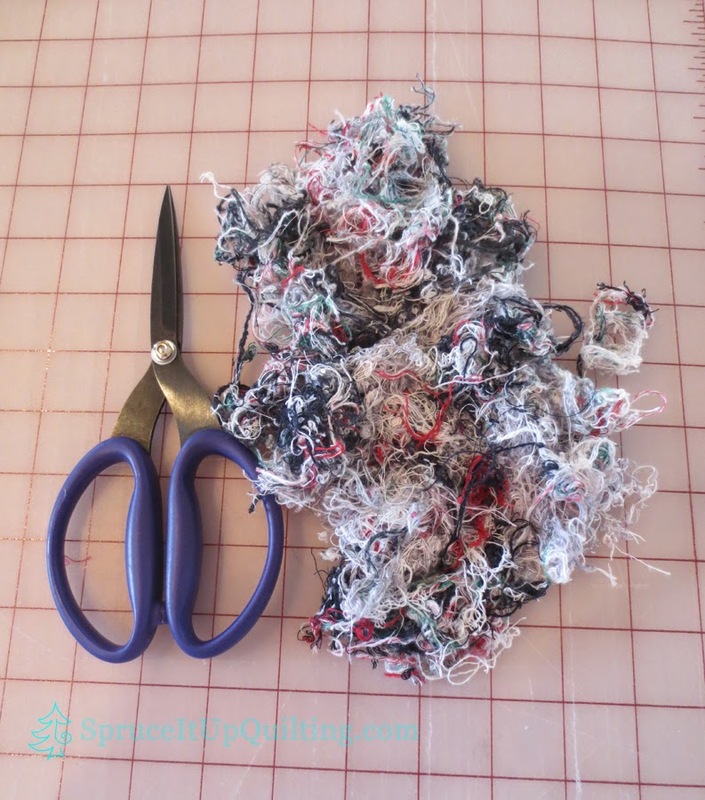 Bindings take a beating and should last longer with newer fabric. I designed the chess pieces on paper first then raw-edge machine applique'ed them and in the process ruined the zigzag on my 1975 Singer Diana 560 sewing machine. It still works but cannot perform the stitches as well as it used to and definitely not zigzag! It's been quiet ever since! I loved sewing on that machine... it was money well spent although it was an expensive purchase at the time. I'm happy though that the chess pieces are still looking good, the zigzag is holding. Meanwhile, the postman delivered some beauties! 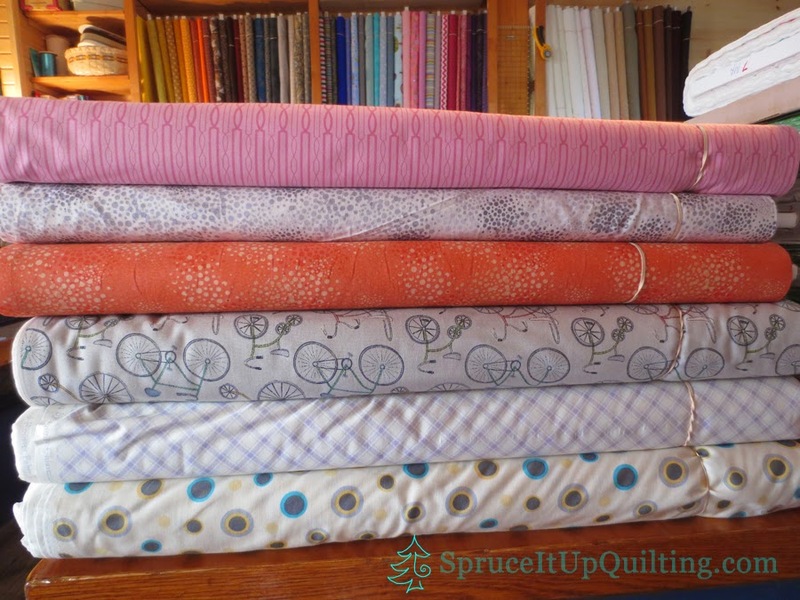 A few weeks ago, I posted a comment on Jacqueline's blog at www.quilt-sewhappy.blogspot.ca and won these! Isn't this lovely?? This is my first win!! I'm thrilled with the Aurifil thread and the smaller spool of Aurifil wool #12; that zippered pouch in small hexies will come in handy when I travel with my applique! 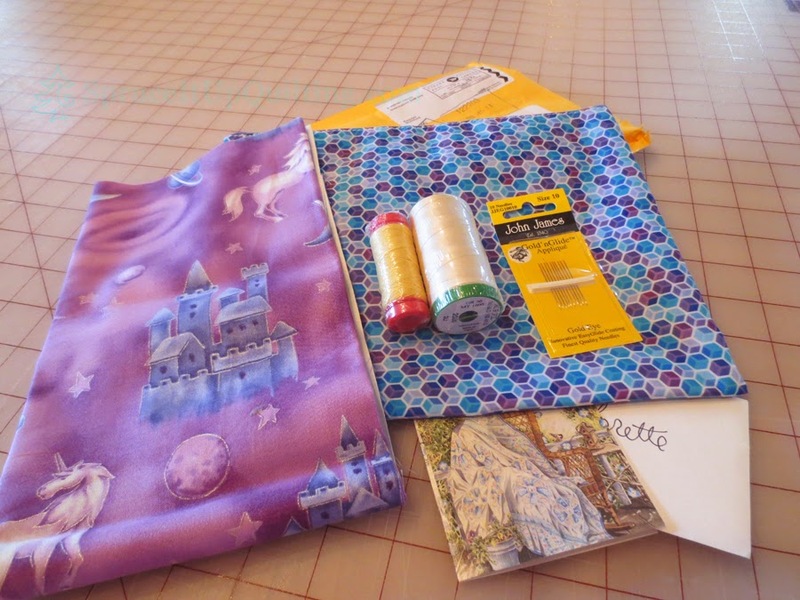 Plus I know just where I'll use the unicorn and castle fabric! The John James needles are my favorite too and these are applique needles! I'm sew happy!! Thank you so much Jacqueline!! 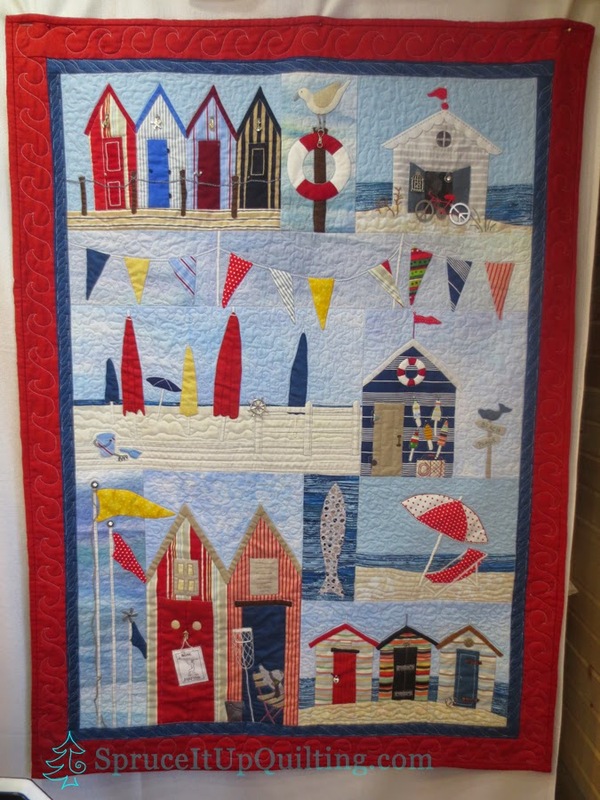 Hope you're all enjoying the summer... the shop has been quite busy so I know lots of you don't stop quilting in the heat... it may slow us down but does nothing to deter the thrill of sewing! Lolah is working with Marie today... Marie is making a carry-on travel bag, a pattern she purchased in the shop last week but she knew she had fabric at home for this project. 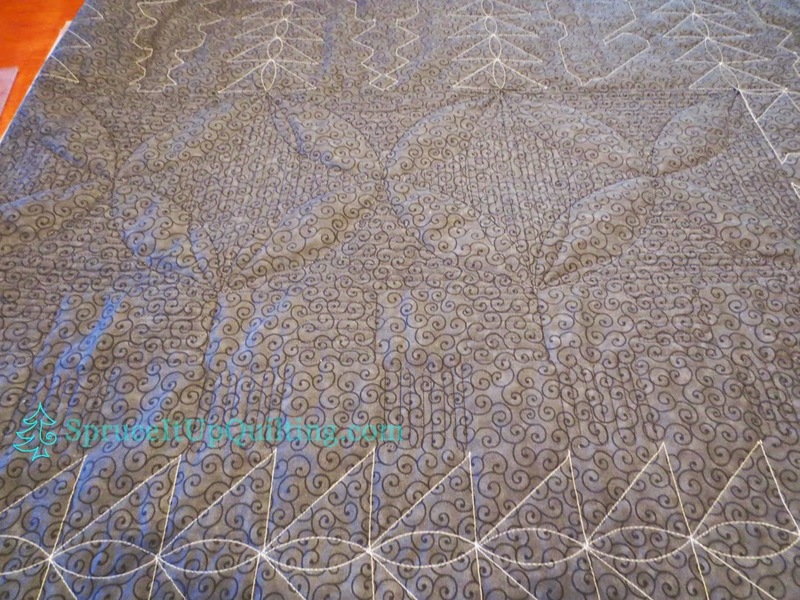 The pattern has 2 methods of quilting/construction but Marie wanted to quilt the fabric on Lolah before cutting the pieces just like in the pattern. 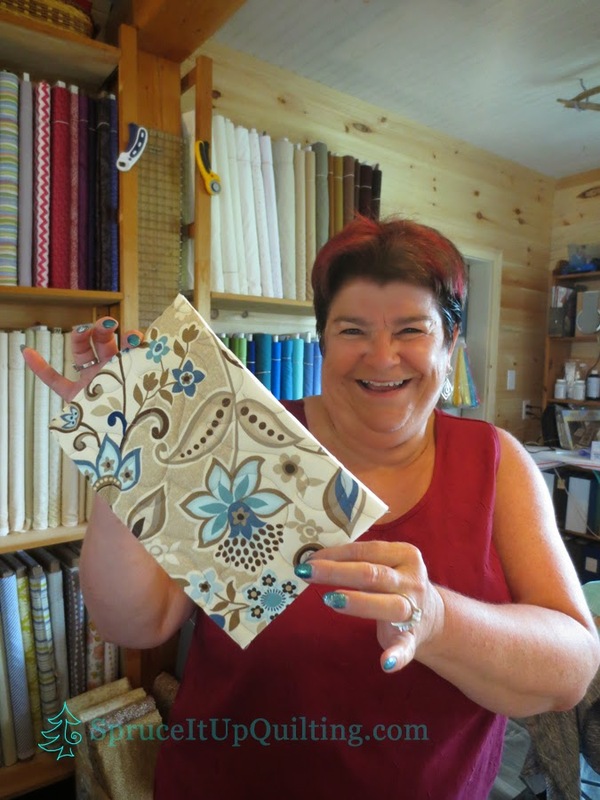 Marie chose Glide thread in Coffee color for top and bobbin and is quilting the Chinese Crescent panto; she's doing a great job too. 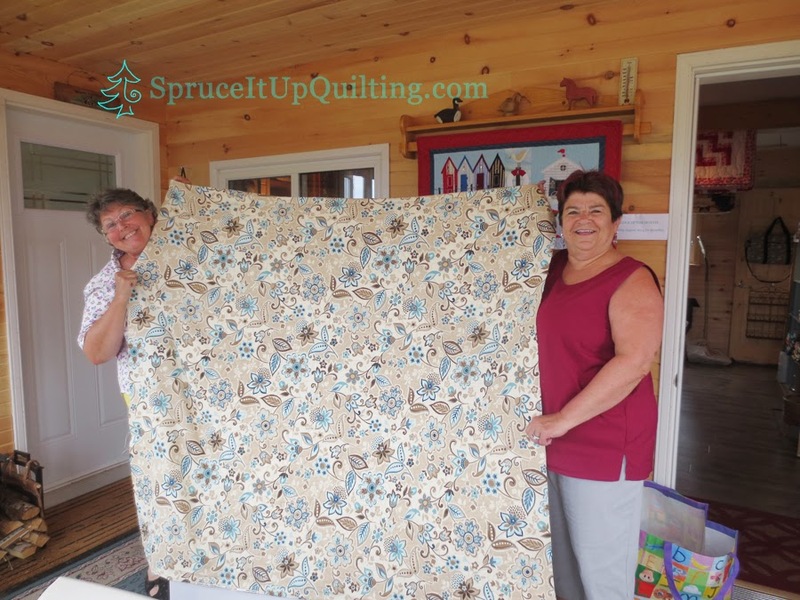 It's wonderful to see her progress and to see her so excited at quilting it herself. 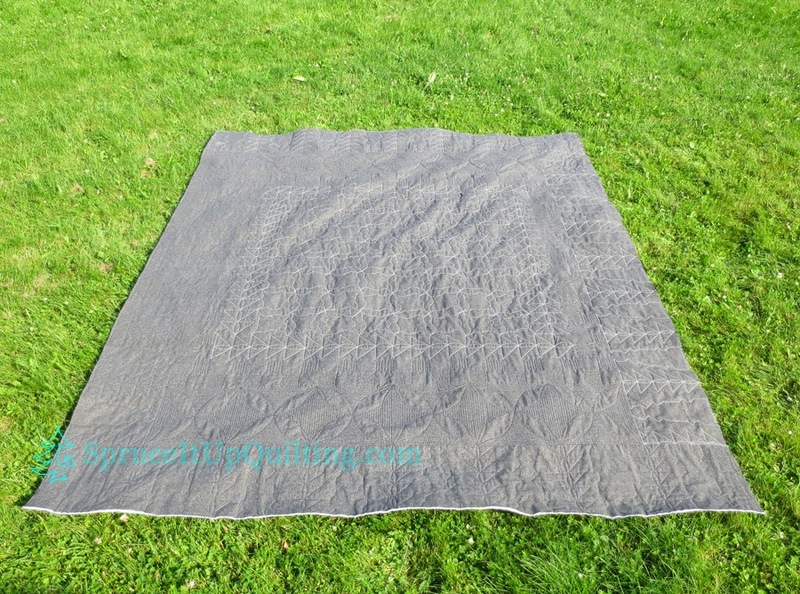 The Soft and Stable byAnnie's is such a wonderful product to quilt and the bags made with it retain their shape. Lolah loves this stabilizer too! It's available by the meter in the shop. Marie forgot to bring her lunch so she called Joy to come over to see her work and to go out for lunch! 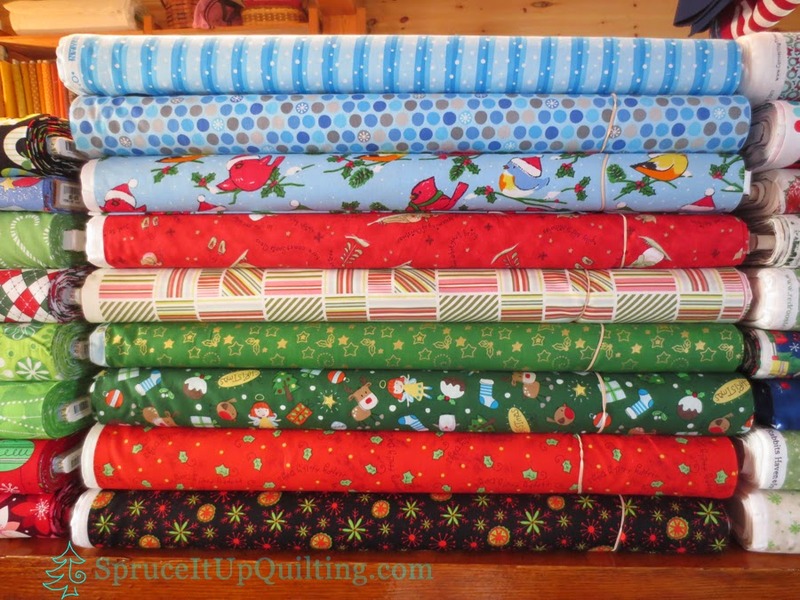 When they returned, there was very little quilting left to do so while Marie finished her quilting, Joy shopped. Isn't this a lovely pattern? She did such a great job! 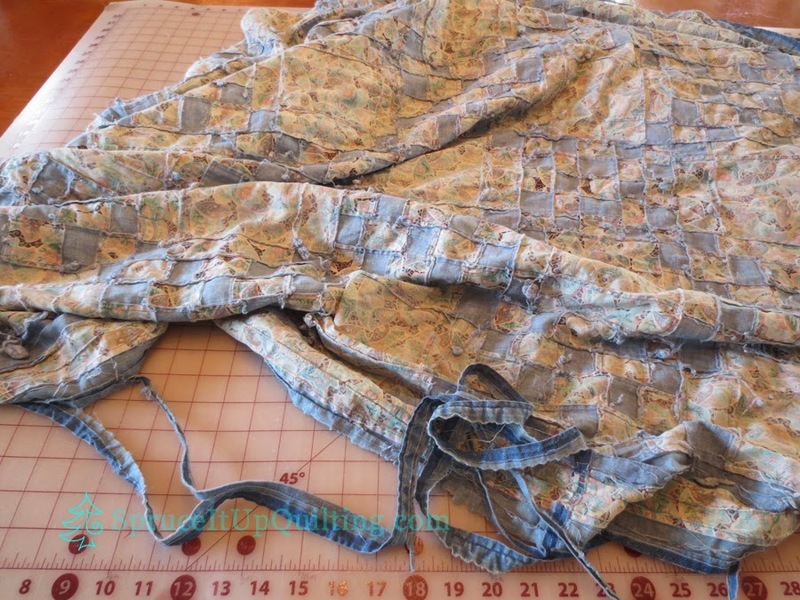 Then we marked all the pattern pieces on the lining side and Marie cut them out and labeled each piece. 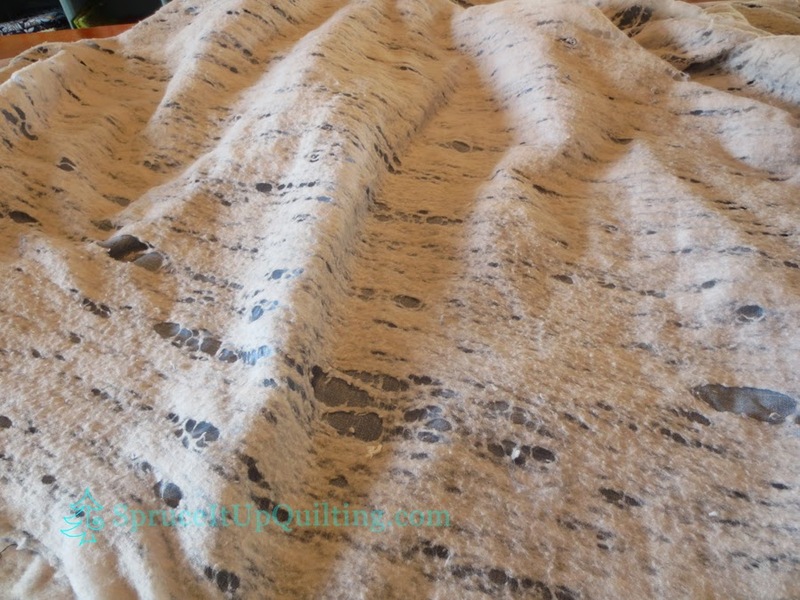 She is thrilled with how this fabric turned out... it really is such a gorgeous fabric! Well done Marie!! I can't wait to see this bag! Meanwhile, I'm working on repairs... my nephew and godson Jason's quilt is one I made for him in 1997 for his HS graduation. He's a chess champion and I wanted to celebrate that. 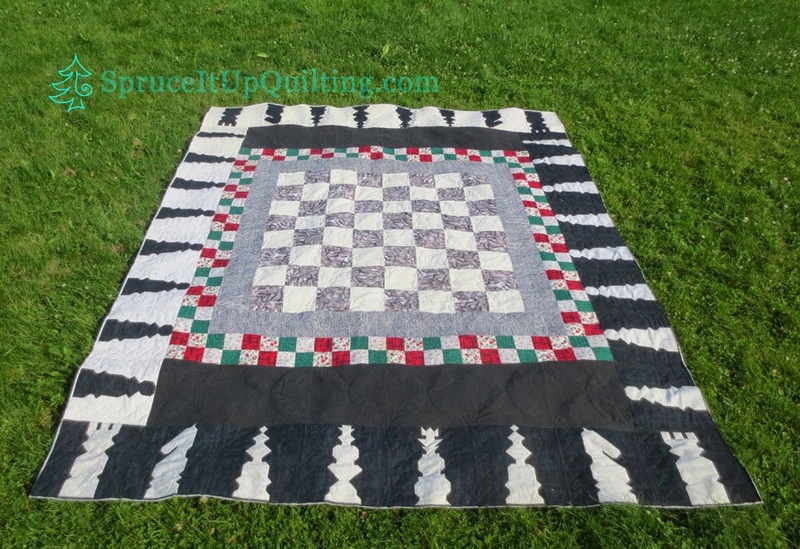 I designed the chess pieces and the quilt as a duvet cover. A few years ago, a tear developed probably hooked along the foot of the bed frame. This will have to be repaired of course. 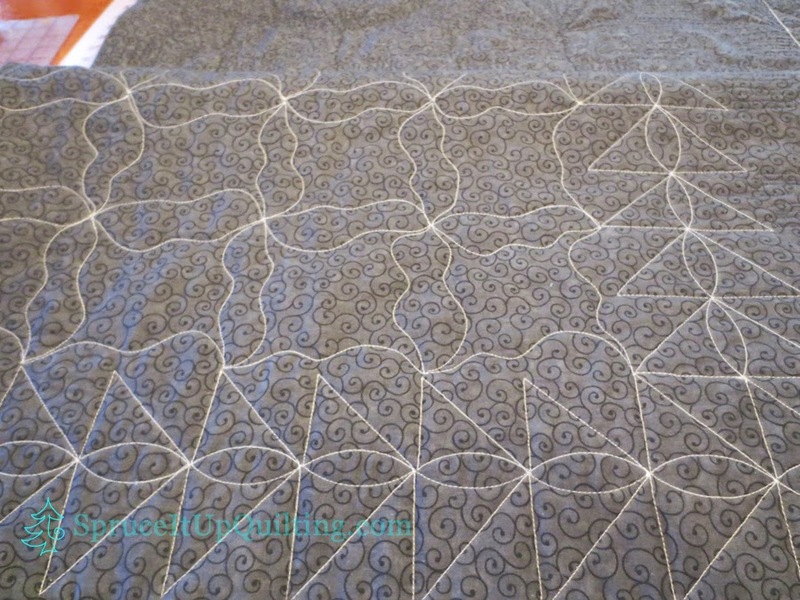 The plan for this quilt is to remove the backing, load a new backing that is longer and wider, & quilt it on Lolah. 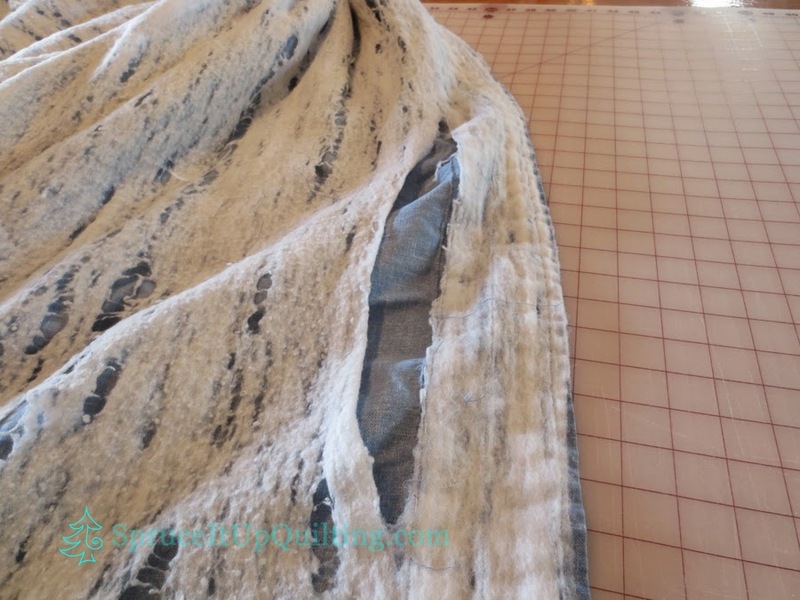 The removed backing will be used for binding and perhaps pillow cases to match. 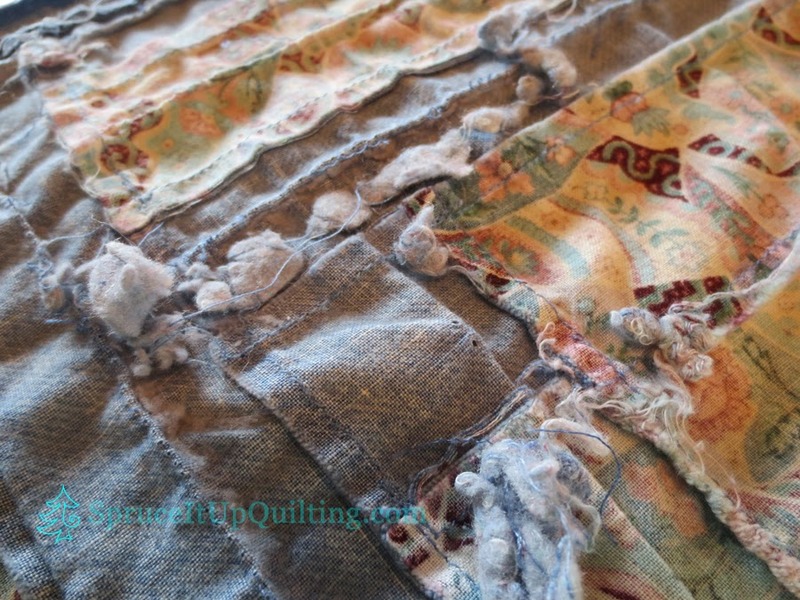 But first, it's important to clip all the loose and bunched up threads on the reverse side of the top. 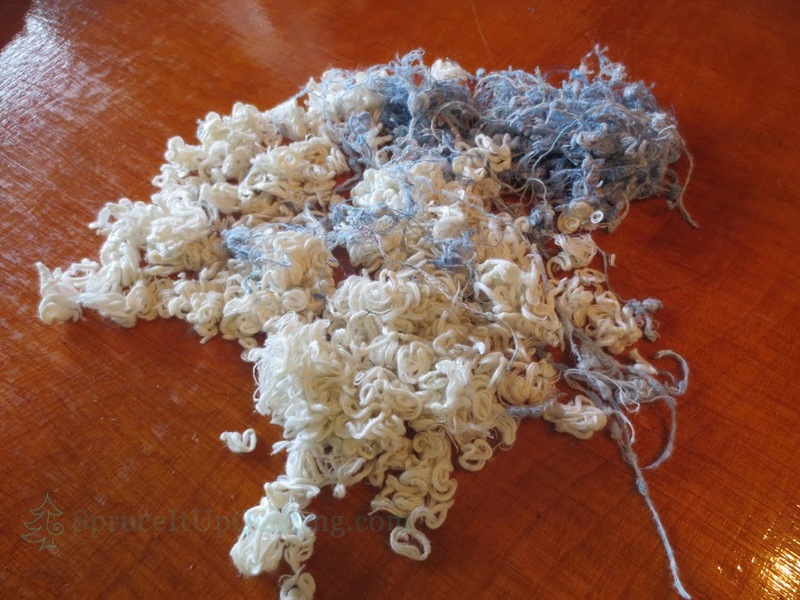 It's amazing the amount of threads... Lolah wouldn't like having to hop over those. You'll have to wait to see the photos of the before and after photos. A little suspense!! After all, my sister, his mother reads this blog... I'd like to keep some of it as a surprise! will be closed tomorrow Saturday July 12th. I am traveling to see my mother who resides in a nursing home and I will connect with my sisters for a nice evening together. 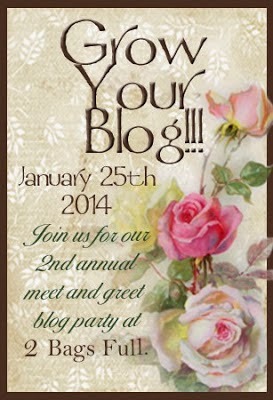 PS: Shop hours and location with tel no are now available in the blog header! It must be said that my time on the Internet is quite curtailed these days; that with the shop and the activities of summer, it feels great to be busy. Even Hurricane Arthur which came to our shores Saturday morning as a tropical storm didn't deter our plans. 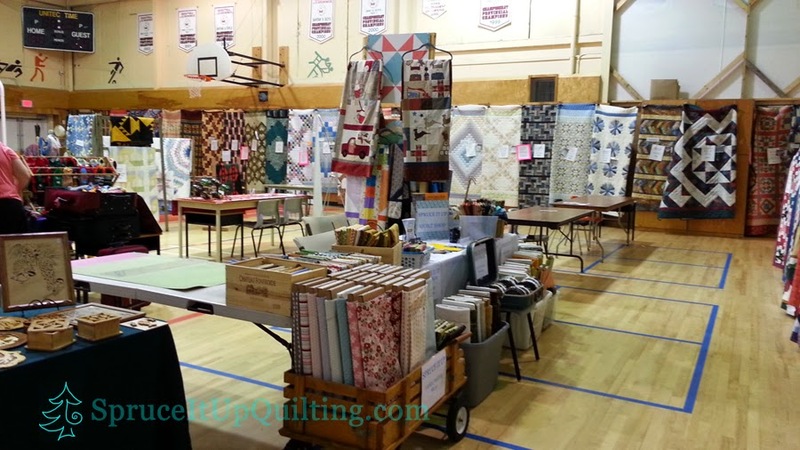 Even before the shop opened, I had plans to be a vendor at the Annual Lupin Quilt Fair and Market (in its 33rd year) in our little town of Port Elgin NB. Ever since I made those plans, I've been preparing for that weekend. 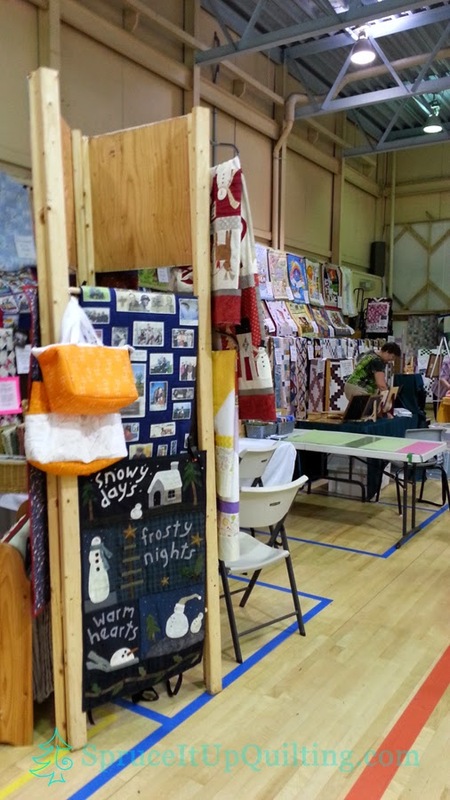 Quilters are a hardy bunch; attendance was down on storm day but it picked up on Sunday. 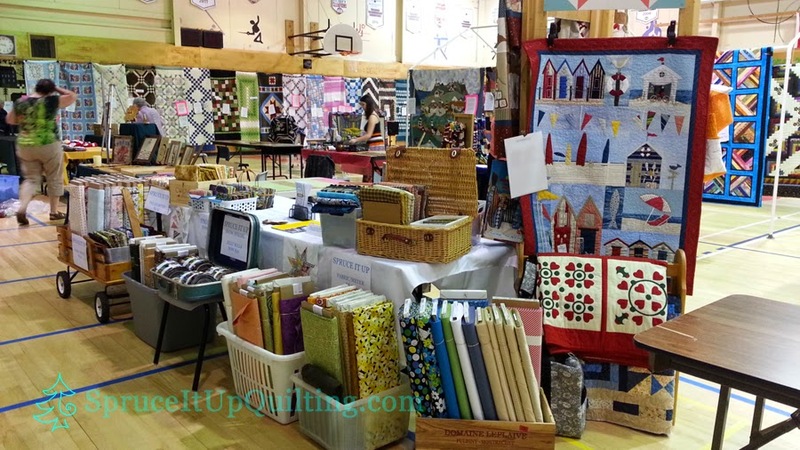 This was Spruce It Up Quilting's booth! My husband made the quilt rack and added the signs! 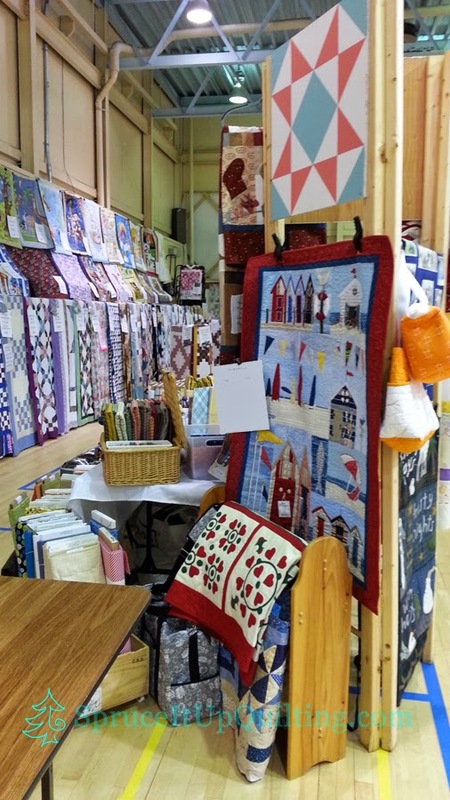 I had no expectations for this venue since I was a newcomer... the point of being there was to meet quilters and non-quilters who had great interest in the art and to have a chance to share my love of it. I achieved that and more! The reception I got was overwhelming... 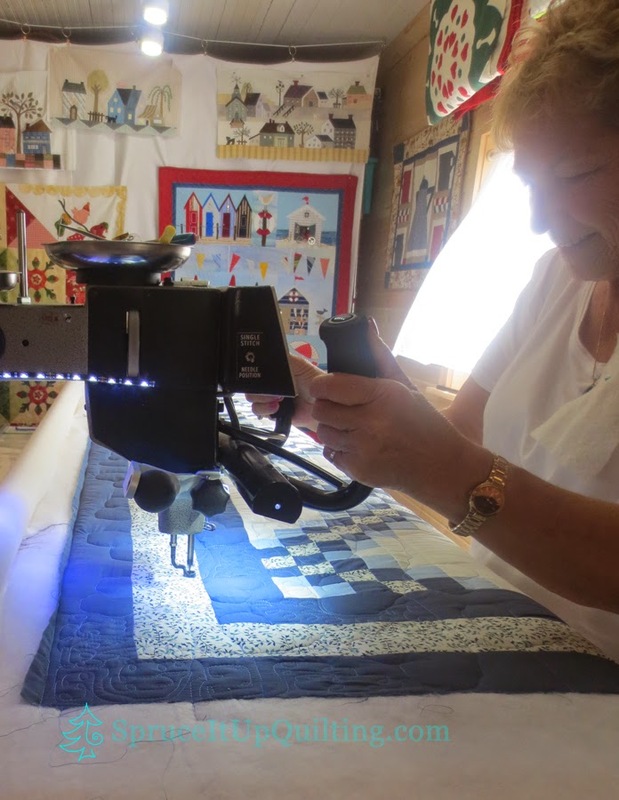 I hope quilters see the shop as a friendly place to visit, to shop and especially to come show me their works of art... after all it goes both ways! We all learn from each other. I love to see what others are making! As you can see, Deauville is front stage. A lot of people commented on it... after all, this is cottage country. Many asked if it was for sale! Many more took photos! 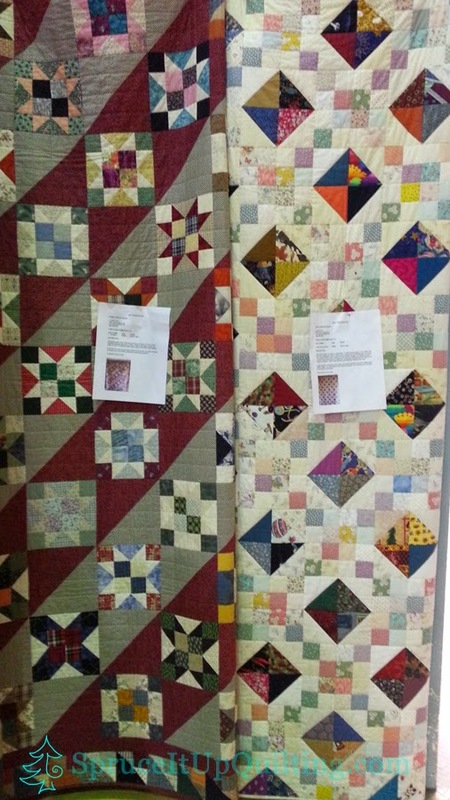 I had a few of my own quilts on display in the gym... the one on the left was made in 1994-95 and finished a few years later. 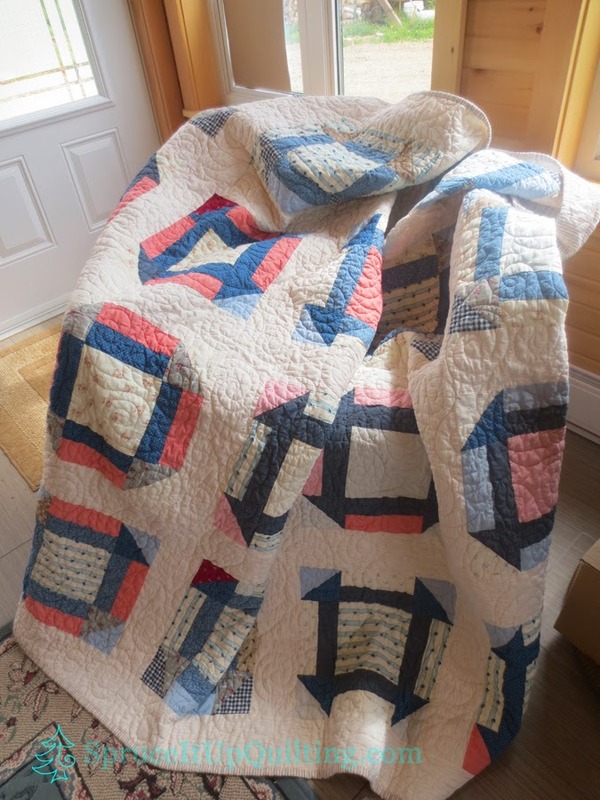 The pattern was featured in Fons and Porter's For the Love of Quilting in the second or third magazine issue. It is called Fat Stars because I used over 120 fat quarters to make the pieced blocks. 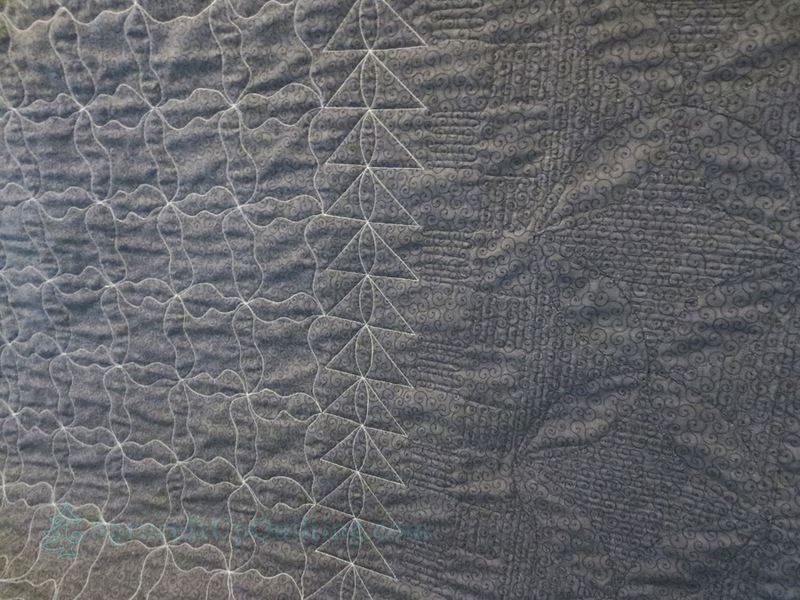 I hand-quilted this one myself. 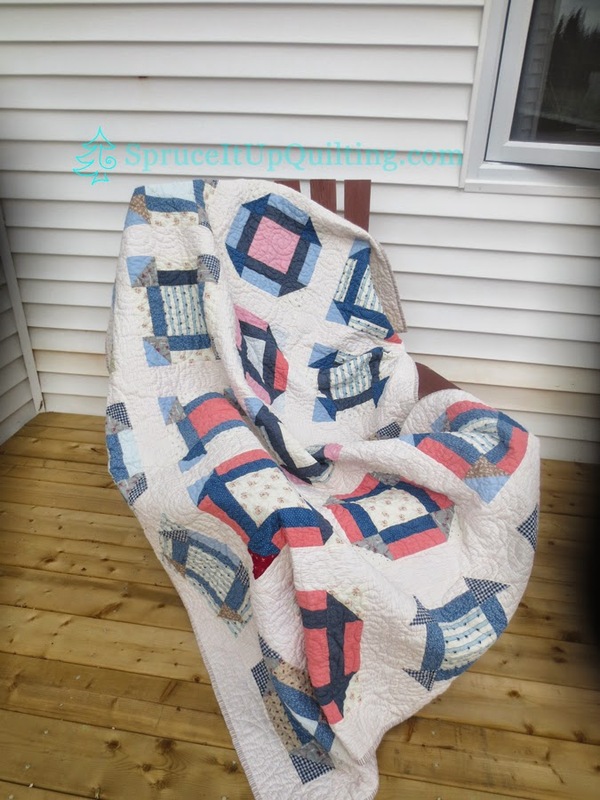 The quilt on the right was made with leftover fabrics from a signature quilt I made for our parents as a Christmas gift in 1994. The colorful fabrics were chosen by each family member to represent themselves. I couldn't let those leftovers go to waste so I used 30s reproduction fabrics to frame the jewels. It's called My Family Jewels because I can identify each family member in this quilt. This one was hand-quilted by the Anglican Church Women's group in Westcock NB. Both are queen sized and not for sale! Barnside is also bound and ready to send off to our dear friend diagnosed with cancer. After finishing the binding, I tossed it in the washing machine and it came out so lovely! 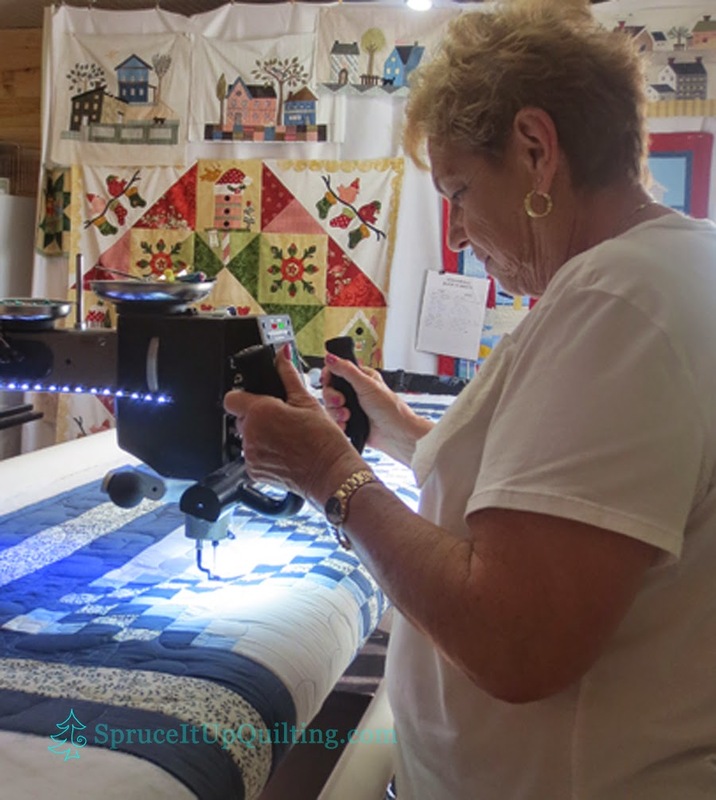 While I was photographing this quilt, Sadie was busy putting the final stitches to her large quilt! Excuse the bright light from the window behind her. Sadie spent yesterday quilting hearts on her top and after finishing the last row, she wanted to add more quilting. 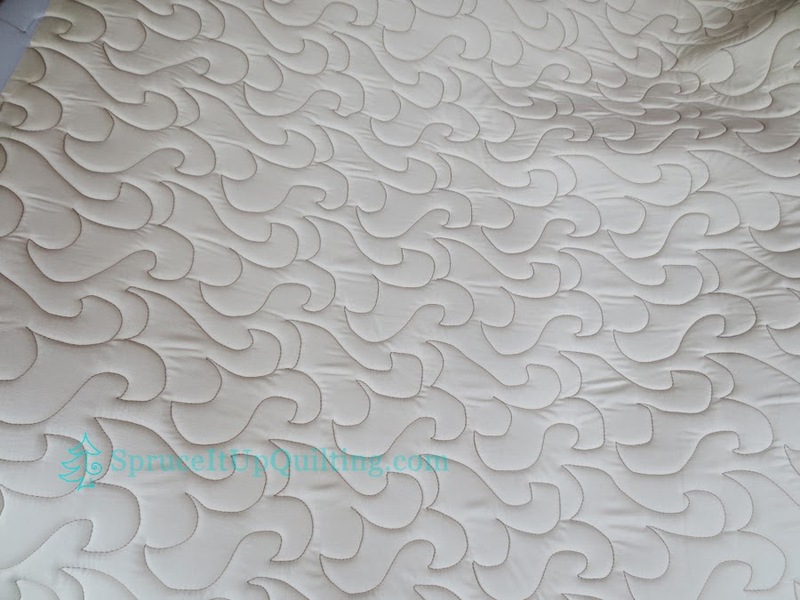 She decided to return today to do some free-motion quilting in the spaces between the hearts. She found her groove and in no time, she was done! She was so excited to be in front of the machine and plans to return in August with another quilt for more practice. 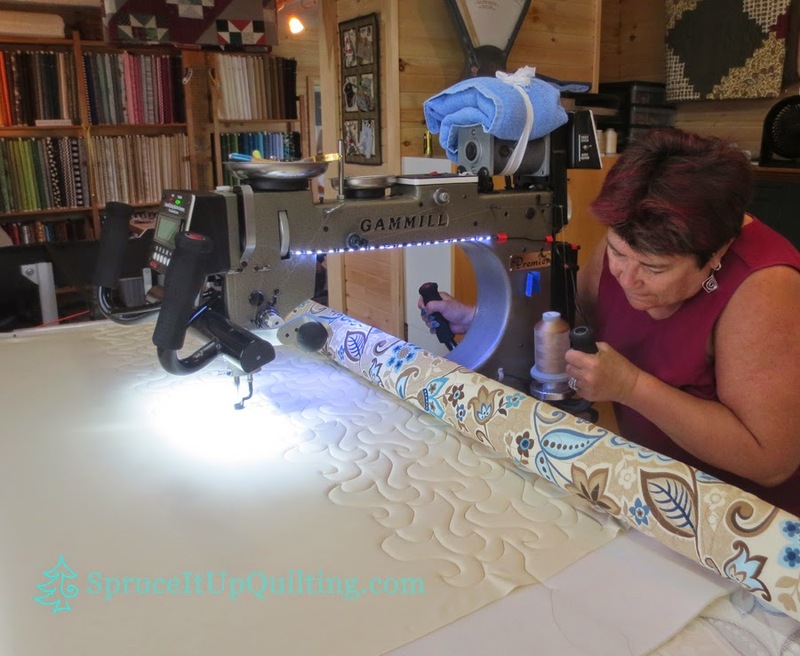 I must tell you that she is also a dedicated hand-quilter who does beautiful work! You too can rent time on Lolah! 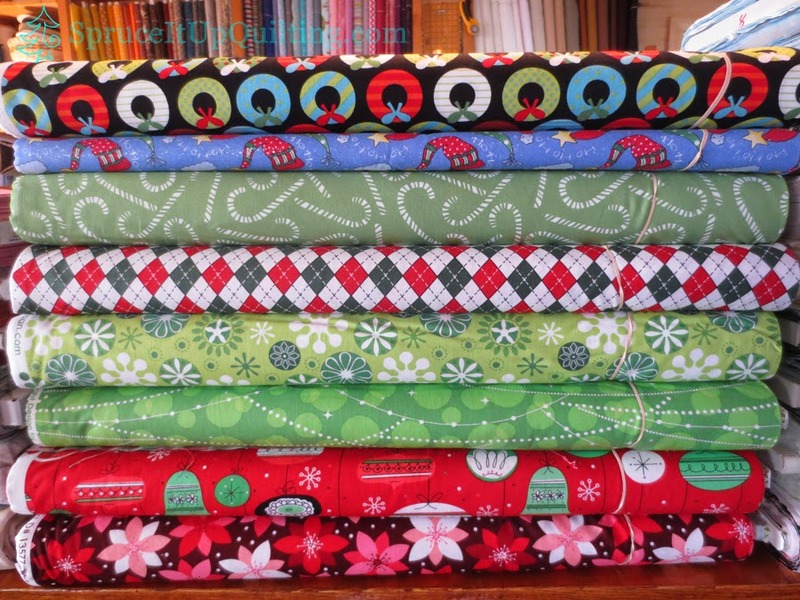 Bring your project in and we'll look it over, choose a design, thread and we'll book a time! 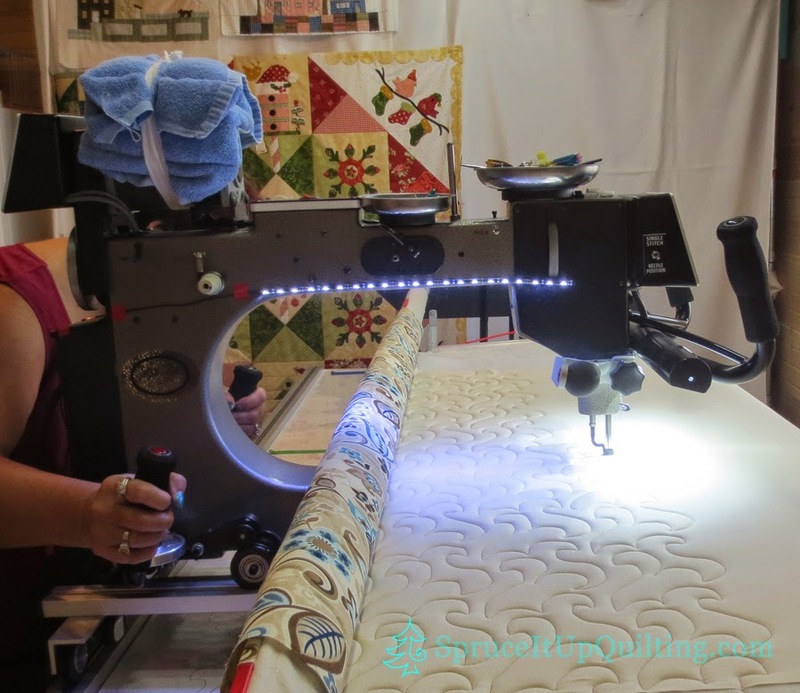 If you already do free-motion on your machine, you will be amazed at how fast you can transition to the longarm. There's a learning curve and it takes practice but you'll surprise yourself! Sadie went home with a smile, so proud to have done it herself. Monday morning, we'll have 21 new backings; 108" X 108". You won't believe our prices! Perhaps I'll see you soon!